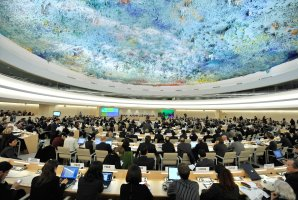 The US-sponsored resolution on Sri Lanka brought to the UNHRC was passed by the member states following a vote, a short while ago in Geneva. 25 member states voted in favour, 13 against while 8 abstained from voting. India and South Korea were the only Asian countries voted in favour of the resolution while Pakistan, Venezuela and Ecuador voted against. Japan and Malaysia abstained from voting. A senior official said in Colombo that the final voting was not a surprise because of EU and US pressure tactics. “While US twisted the arm of Korea to get its vote, India failed to muster any support. It shows India’s unpopularity,” he said. An official in the external affairs ministry blamed the Sri Lankan High Commission in New Delhi for, what it described as its total blunder to get support from all the African and Latin American embassies concurrently accredited to Sri Lanka from New Delhi. “Mission in New Delhi failed to brief them properly,” he said. Austria, Canada, Croatia, Belgium, Denmark, Estonia, France, Finland, Georgia, Germany, Greece, Hungary, Iceland, Ireland, Italy, Liechtenstein, Lithuania, Malta, Monaco, Montenegro, Norway, Poland, Portugal, Romania, Slovakia, Slovenia, Spain, St Kitts and Nevis, Sweden, Switzerland, United Kingdom of Great Britain and Northern Ireland and United States of America.